“How did he do that?” is just the tip of the iceberg. Laugh, cry and be amazed, all in one spectacular performance by the winner of America’s Got Talent, Mat Franco. Voted “Best Magic Show in Las Vegas” for two-years running by the Las Vegas Review-Journal, Mat Franco’s immersive live show leaves audiences awe-struck with his unique feats of illusion. America’s favorite magician is redefining the genre with his signature interactive magic as seen on TV, and never-before-seen creations. 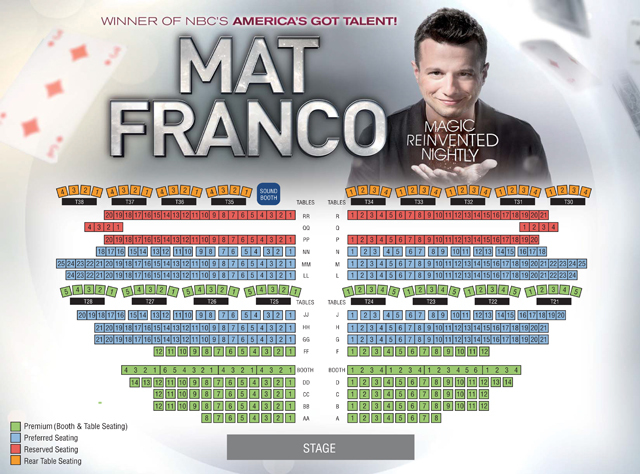 Witness it now at Mat Franco - Magic Reinvented Nightly! Your Las Vegas Mat Franco – Magic Reinvented Nightly tickets offer you the opportunity to see the Rhode Island native up close and personal as he performs brand-new, never-before-seen material. Purchase your Mat Franco – Magic Reinvented Nightly tickets today and experience a truly stunning sense of wonder and imaginative thrill that is unlike any other magic show on the famed LV Strip.